Thanks to Dr. Marianna Shartsbeyn, Acupath Laboratories, Inc. for contributing this case and the discussion. To contribute a Case of the Week, follow the guidelines on our main Case of the Week page. (1) Find any recent Pathology related book easily with our Books page, with links accessible on the Header and Footer of each page. Using the Table of Contents, you can search for a book by Publisher, Books Series, Specialty or Date posted. You can also search by Author or Title using the Search Box. Read more here. (2) Our newest Commercial Email contest winner is Suzan Kavusi, MD, from the University of Washington. A $50 Amazon gift card was sent to Dr. Kavusi. Please make sure to sign up for and read our Commercial emails for a chance at another contest! You can't win if you don't enter. (3) Win a $100 Amazon gift card with our new contest, which runs through 12 March 2017. The challenge - suggest how we can better get pathologists to buy from Amazon.com through our website. It could be a catchy advertising phrase, or an idea on where to post this information, or something else. Email NatPernick@gmail.com with your idea. Read more here. A 83 year old man presented with a rapidly growing scalp mass. An excisional biopsy was performed. 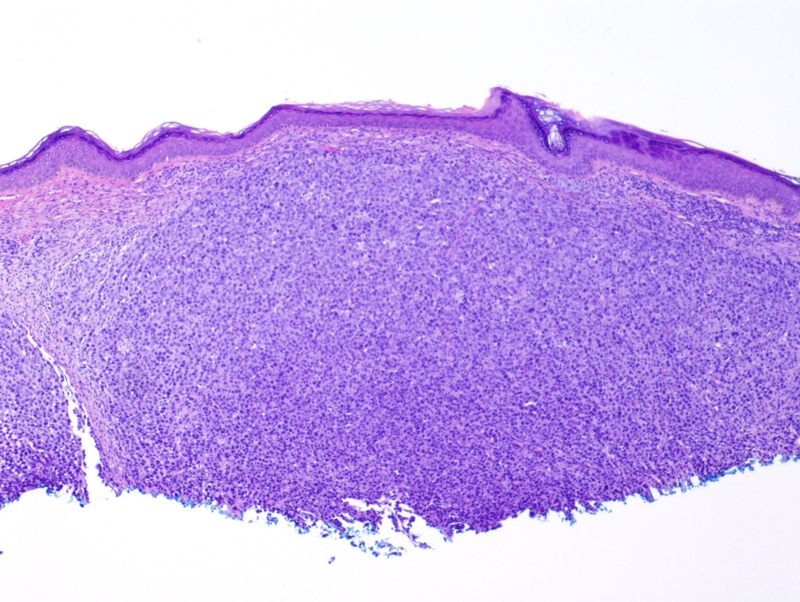 Histological sections reveal a dense dermal infiltrate of large atypical lymphoid cells arranged as nodules, sparing the epidermis. 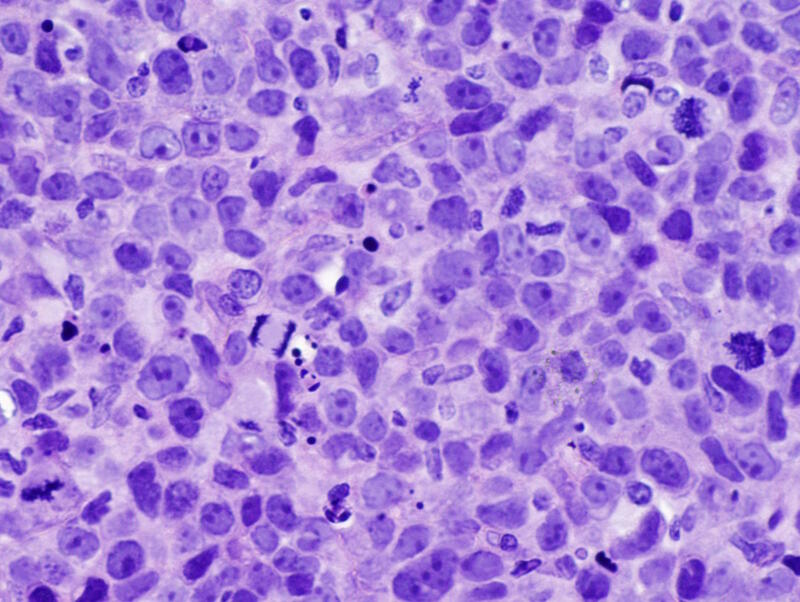 Neoplastic cells feature moderate amounts of pale staining cytoplasm, large irregular nuclei with conspicuous nucleoli and brisk mitotic activity. By immunohistochemistry, CD30 is strongly diffusely positive in a membranous and Golgi pattern, and the Ki-67 proliferative index approaches 100%. In addition (not shown), tumor cells express CD45 and have an immunophenotype of CD4+ activated helper T lymphocytes, with aberrant loss of T cells markers CD3, CD5 and CD8. 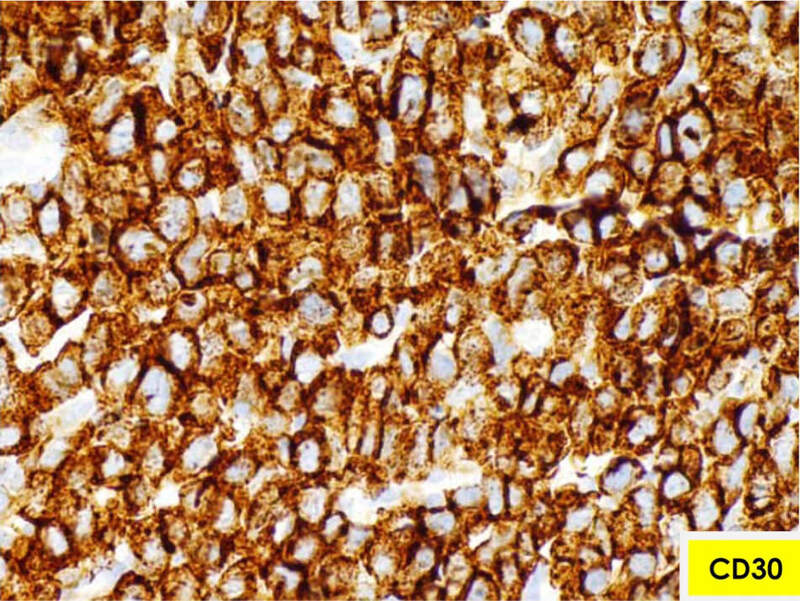 Tumor cells are also negative for melanocytic markers, pan-cytokeratin, CD43, CK20, EMA and ALK1. 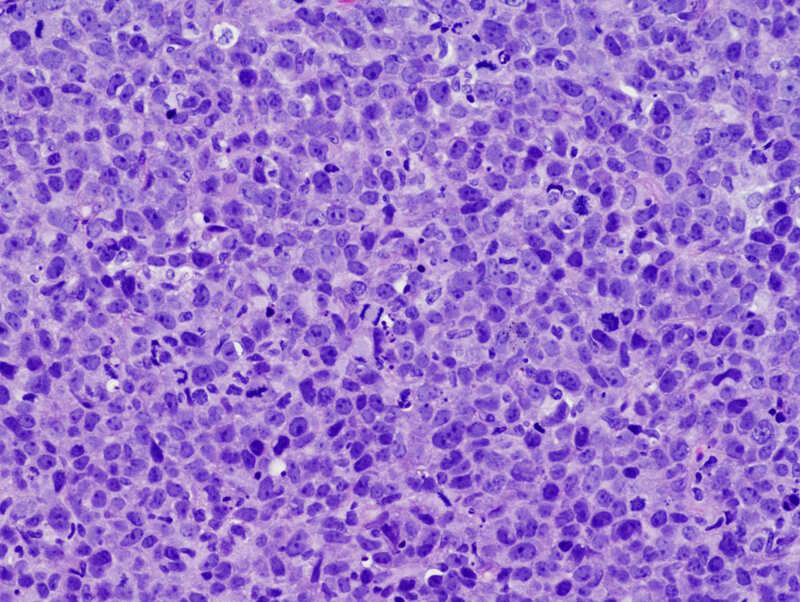 Cutaneous anaplastic large cell lymphoma (C-ALCL) has unknown etiology. 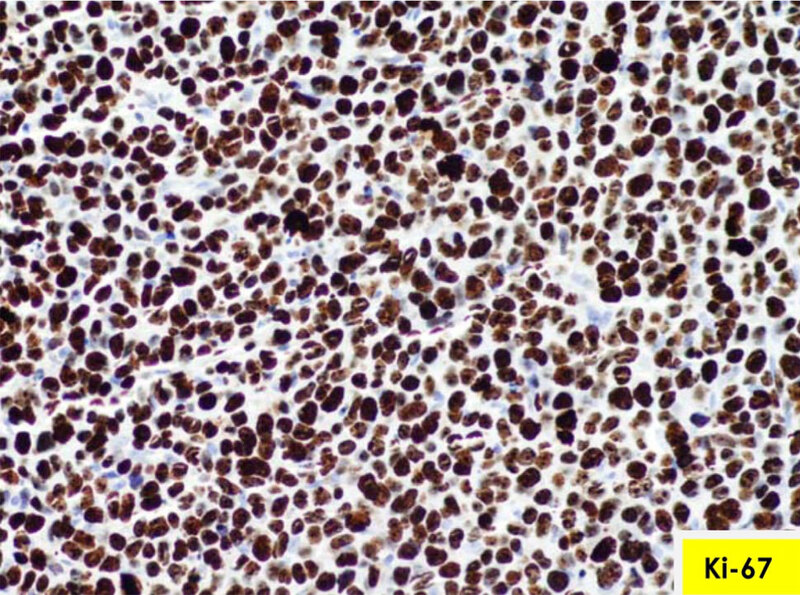 It is composed of large atypical lymphocytes with pleomorphic, anaplastic or immunoblastic features and expression of CD30 by most tumor cells. It usually occurs on the head and neck and extremities of older men (although it can affect children), and is particularly prevalent in HIV+ patients,. It presents as a solitary firm nodule that grows rapidly. C-ALCL has an activated helper T cell phenotype with variable loss of some T cell antigens and expression of activation markers CD25, CD30 and HLA-DR. The tumor cells may be positive for cytotoxic markers granzyme B and perforin. 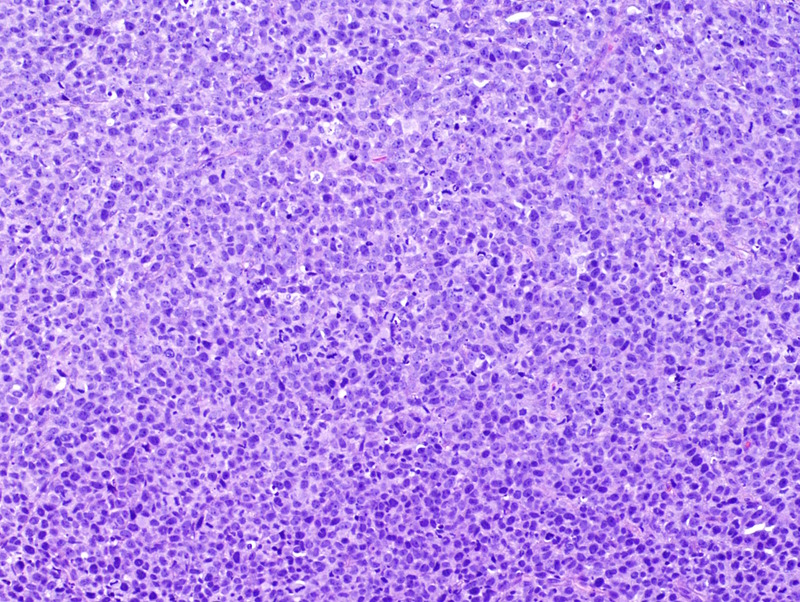 C-ALCL is on the aggressive end of the spectrum of primary cutaneous CD30 positive T cell lymphoproliferative disorders, with lymphomatoid papulosis at the benign end. 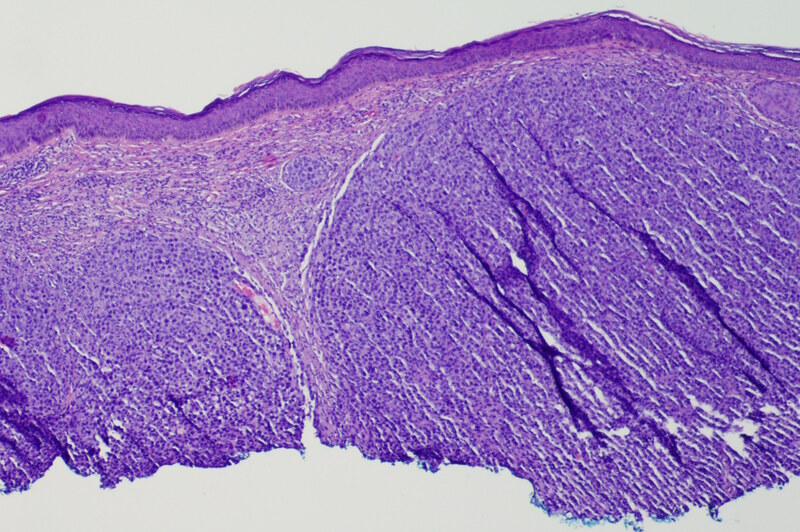 By definition, CD30 must be expressed by over 75% of cells, and there should be no history of lymphomatoid papulosis, mycosis fungoides or other cutaneous lymphoma. Primary cutaneous form (C-ALCL) must be distinguished from primary nodal CD30+ ALCL, as it has a different prognosis. The two entities can have similar morphologic and immunophenotypic features. Moreover, the cutaneous disease may secondarily involve regional lymph nodes, and systemic ALCL may have a skin presentation. Features favoring cutaneous disease are lack of ALK1 expression (but aggressive systemic variants are also ALK1-), EMA- and lack of t(2;5)(p23;q35), which creates the NPM-ALK fusion protein in systemic disease. 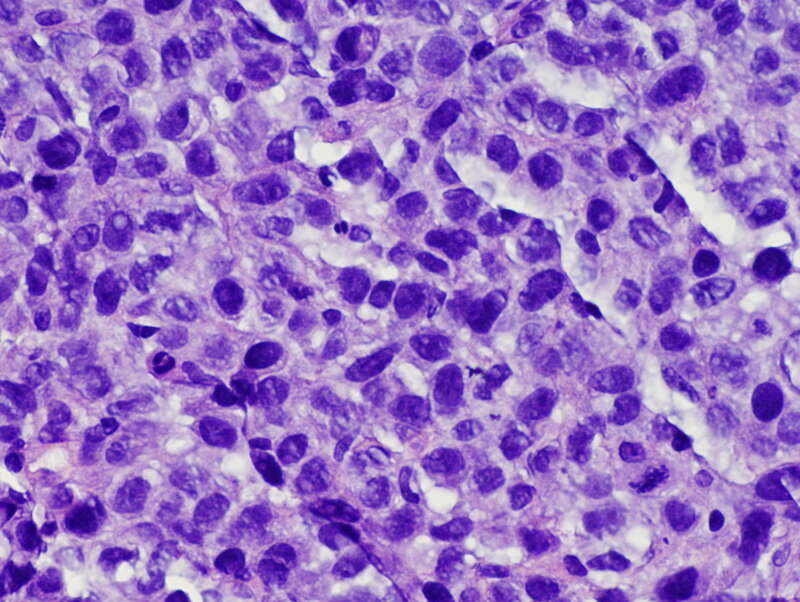 Despite its anaplastic morphology, C-ALCL has an excellent prognosis, with a 5 year survival over 90%, and up to 40% of the tumor showing spontaneous regression (Haematolymphoid Tumours, Chapter 4 in: LeBoit PE, Gunter B, Weedon D, Sarasin A, Eds. 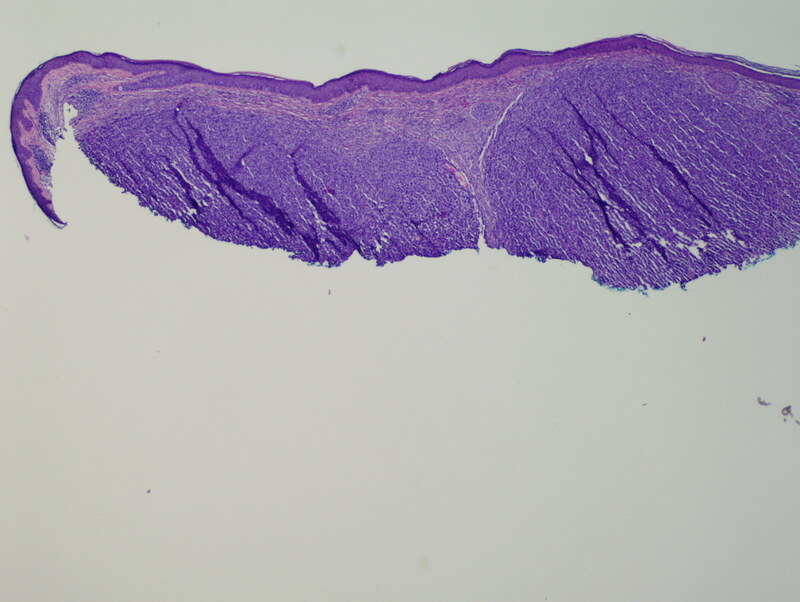 Pathology and Genetics of Tumours of the Skin. 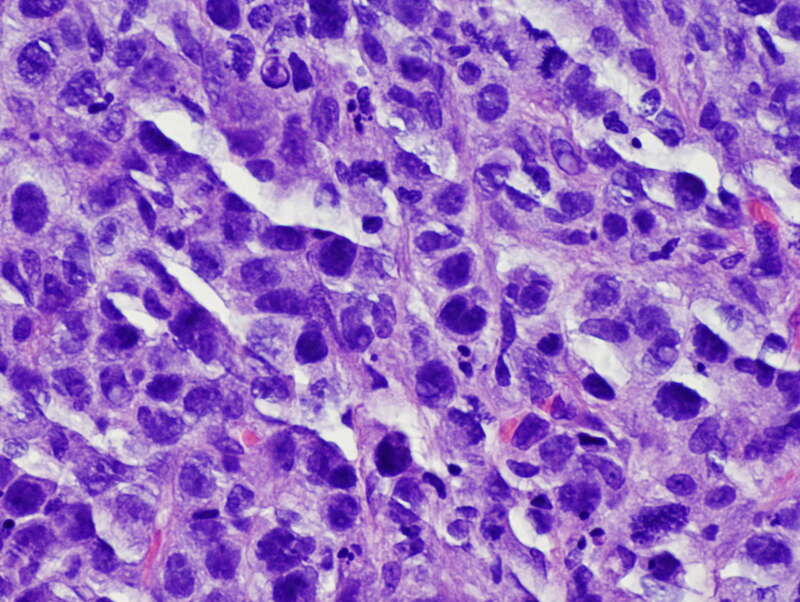 WHO Classification of Tumours, Am J Clin Oncol 2013;36:526). Discussion edited by Nat Pernick, M.D.